Sunday April 24, 2011: Going Home! My time in New England was up. So I made my way to Hwy 20 and pulled into the Granby Center. Yup! the McDonald’s were there in the corner and everything else was closed. The last time I stopped at this McDonald’s it was odd. This time it was very pleasant. They even had cakes and cupcakes out on a table for the patrons. It was Easter and they were celebrating. I purchased lunch and cup of coffee and took a rest break. Sort of listening to the activity and talk in the restaurant. Time to head out. I had taken this route before so I was not to concerned. It was flat an easy highway. I west east on Hwy 20 or rather Turkey Hills Rd. I turned right onto East Granby Rd. to Rainbow Rd. and over to High St. and up to Poquonock Ave or Turnpike Rd. I got to see houses and had less traffic. Hwy 20 is 4 lanes so it was not that bad. Poquonock or Turnpike Rd. 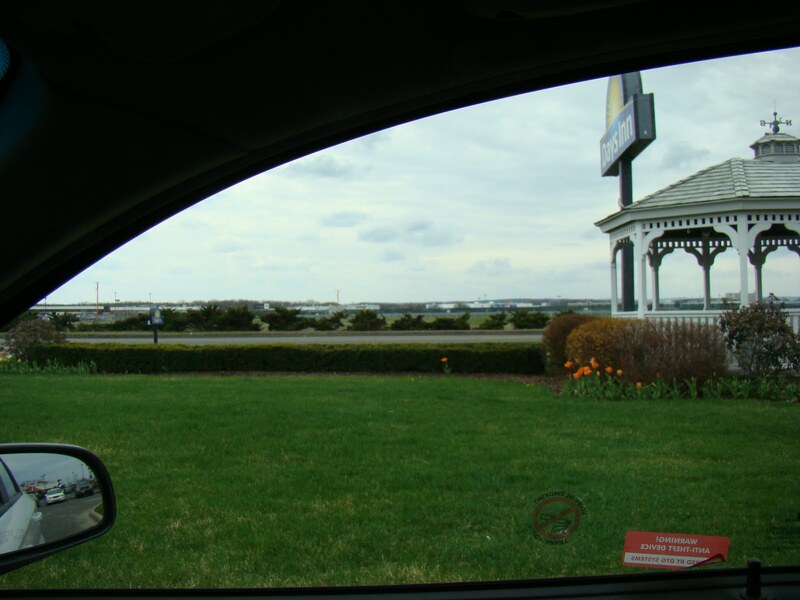 is east of Bradley Airport and filled with gas stations, restaurants, hotels galore. I stopped and filled up the Aveo with gasoline and watched the gas gauge impatiently move to the filled up position. I turned it off and tried again. Much Better! A little more organizing and putting things away. Nostalgia took over and I stopped the Days Inn and positioned my little Aveo in the driveway area next to the breakfast area and took this photo. You must realize that when I was there the last time on my trip I stayed her for one night before flying out. I was up at the crack of dawn and ate my breakfast watching the sun come up over the airport. Now granted I am facing west but it still was fun to watch the day come up. Bradley Airport in the distance! Pretty flat? Yeah it is. My goal was the Thrifty parking lot and turning my rental car in. I had done 888 miles on this trip. I was going to miss my little Aveo. She had been a good car. My goal back to the Thrifty lot was 2 pm and it was just about 1:45 pm. The Thrifty lot is on Spring St. and that soon came up and I turn right and then left. Checking out was easy but I was sad to leave the Aveo there! The shuttle was waiting so I climbed in and we were soon off. Oh dear, vertigo. This thing leaned and I had to close my eyes. I had done real well on the trip with my “car anxiety.” This was the first time it hit me in 3 weeks. We dropped a man off at the Double Tree and headed back. I was United the other nice lady was Delta. She had this great bracelets on her both arms. Reminded me of Wonder Woman! I know I am silly. I had no memory of Bradley International Airport. They had done some remodeling and it was very pleasant with the big windows letting in a lot of light. The United ticket agent was pushy. I didn’t have my ticket printed out yet and she had my bags done before it so then she just took over and punched things in. Most of them leave you alone to do it yourself? Good thing no one was around. Security was a bit confusing. I didn’t get all the change out of my pocket so she had to double check me. Security done I was soon at the gate but not a sole was around. So I called my hubbie and we chatted for awhile. I had plenty of time to dally. You can use Google Images to see photos of the airport and of course anything you like. Its fun. I started reading Breaking Dawn again. Time to see what Bella, Edward and Jacob were up to. The flight out of Bradley was on time and since I was busy reading the time flew by and we were in good old Chicago again. The Departure board was really odd but finally I found my gate and headed there. It took a time to a walk which required doing down an escalator and on several of the flat escalators. Basically I had to under the airport to get to B wing. I munched on my snack of crackers and cheese. I decided to wait for the plane to get some juice or water. Oh Dear….the plane was delayed. We were suppose to leave at 8:58 pm from Chicago. Well it was now 11:15 pm. Blame it on New York weather or technical difficulties. It was a work day the next day for my hubbie but he persevered and waited for me. I think he was desperate for me to come home after 3 weeks. HA! I tried to sleep on the plane but the man next to me was restless and was constantly moving. I finished my book in Chicago. Now I am ready for the movie which will be out in the next months? The inflight movie looked odd! Finally in at 1:30 am on Monday morning April 25, 2011. Hmmm…can I rethink the time of this? My hubbie greeted me with a hug and headed out for a Mocha so he could drive me home. It was good to see the van, feel the air of Seattle and home. My bags both came, hurrah! All my trip research and stuff was in them!!! The cats looked at me with a little confusion when I entered our home but soon Sneakers was at my side. A little snack and a little TV to calm me down and I was soon in bed. Home safe and sound. The actual physical trip was over but catching up the remaining posts, links and more was still to come.